As a catering business, while you need to focus on improving your services, you must not also forget to effectively request and collect payment from the services you have rendered. This can be done with the help of a catering invoice. An invoice is a document in a sales transaction that prompts that buyer to pay a certain amount of money and presents a list of the items availed of by the buyer. This is also a form of demand by the seller in order for the buyer to be reminded of his past due. 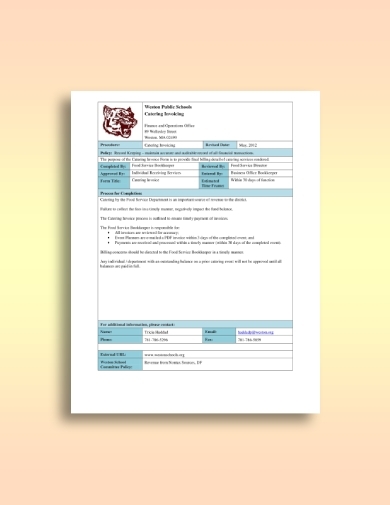 To create an effective and, at the same time, visually striking catering invoice, you can refer to the templates and examples presented below. 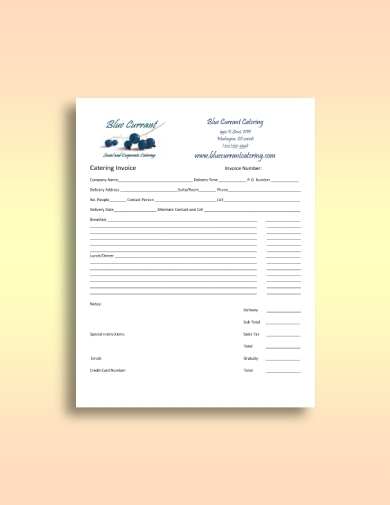 We know how busy it is to run a catering business because you have lots of preparations to make, such as the menu, the materials and ingredients for cooking, catering order form and other catering-related documents, and many others. With this, you might not have enough time in creating other documents needed in a catering transaction, such as an invoice. 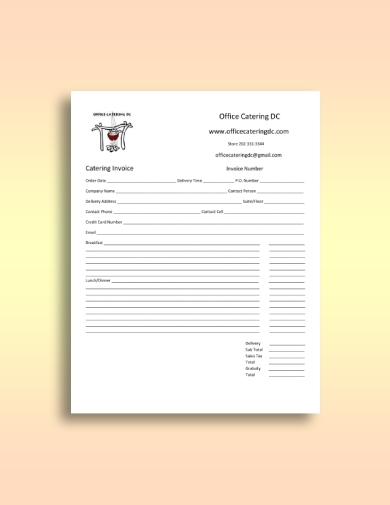 So, in order to help you, presented above is a basic catering invoice template that you can easily edit and customize so it would tailor-fit your current needs. 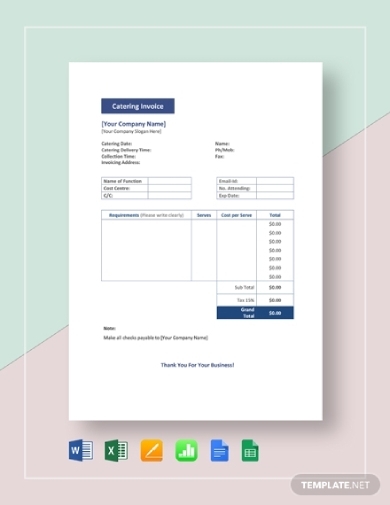 Skip the hassle of creating an invoice with the use of this catering service invoice template that is available in various file formats, namely Google Docs, MS Word, Google Sheets, Numbers, MS Excel, and Apple Pages. Given these different formats, it is very convenient for every user to edit the file and customize it as their own. 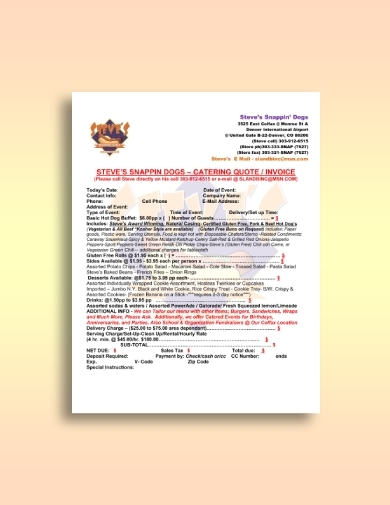 With this professionally crafted standard catering template, you are guaranteed with high-quality graphics and design elements as this is carefully created by experienced graphic artists and designers. Your desired design is just right at your fingertips. All you need to do is to spare a little time in editing the content so it would fit the needs of your catering company. 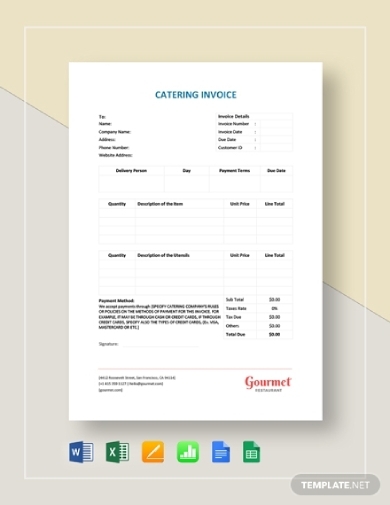 In this simple catering service invoice example, presented are the details about the catering service, including the services provided, the estimated number of people, the date the service is provided, a list of all the items ordered, their corresponding price per person, and the total amount. Pizzas are among the food that most people love because it is very versatile, that is, you can put different ingredients depending on the preferences of the person ordering the food. Because of this, a lot of food businesses offer this kind of food to maximize their profitability. 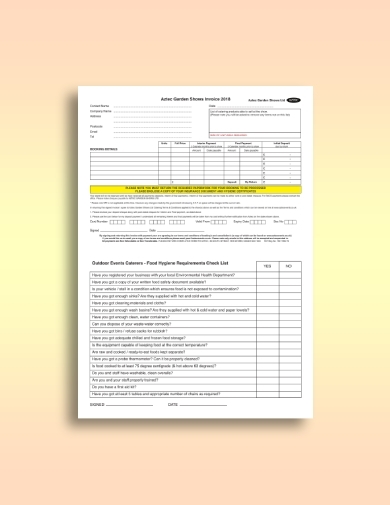 Hence, if your catering company is providing pizza as your main food, you can always refer to this pizza catering invoice as your guide on what to include and how to create an invoice. 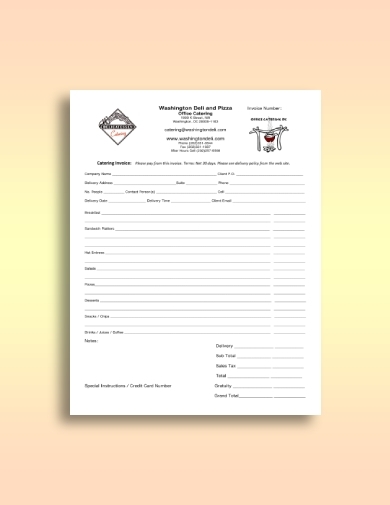 In this invoice example, the following important elements of an invoice are presented: name and information of the catering company, the people who are directly involved as regards the creation of such invoice, the process for completion, and the name of the the person issuing the invoice and his or her contact details, such as phone number, email address, fax number, and website. 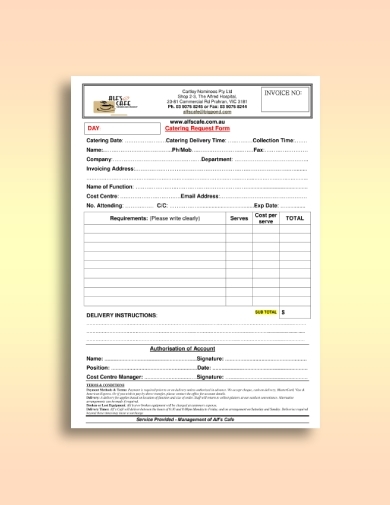 The details to be filled out in this catering invoice form example are as follows: order date, delivery date, PO date, company name, contact person, delivery address, contact number, credit card number, email, additional notes or special requests by the customer, and total amount including tax. Similar to the other examples, this snacks catering invoice features a short list of the items ordered by the customer. 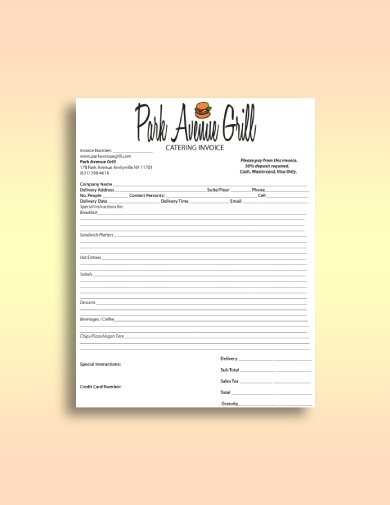 While this is an essential part of the document, it is important that you must also not forget to incorporate the branding of your catering business by including the name of the catering company, catering logo design, and any other branding elements. If you are providing catering services for outdoor events, such as a garden wedding or reunion outing, you must send your customer an outdoor event catering invoice, such as the example presented above, in order to demand the payment of your services rendered. As can be seen from this example, the name of the company is carefully positioned on the top of the paper, making it immediately visible to the readers. 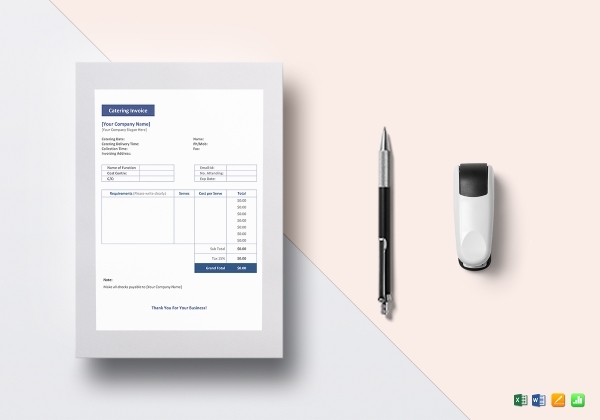 With this, people can easily remember the company that offers such great deals and services because of the little effort of incorporating branding elements into the invoice. Hence, this is something that you must take note when you create your own invoice. No matter how big or small your cafe is, requesting the payment from the client for your catering services offered is essential in order for your company to be profitable. You must have stipulations in your catering agreement with regard to late payments so that customers will know regarding your payment policies. Do not forget to update them and notify them about their balance payable through the use of a catering invoice, such as this example. When having events or gatherings in a university that is participated by a huge crowd, the department or university heads would usually prefer to have a caterer providing meals or snacks. In order for the caterer to ensure that the customer will indeed pay for their services, the invoice must be properly issued prompting the customer to pay for their orders promptly. 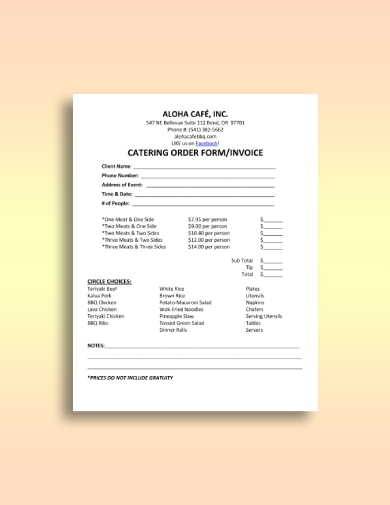 Regardless of the event that you are providing service catering with, it is vital that you professionally demand the payment of your services offered, similar to this event catering invoice. The items being ordered must be presented in a list so that customers can immediately check the correctness and accuracy of their ordered items. 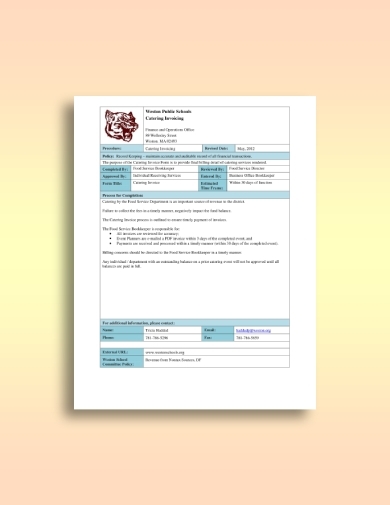 The essential details that can be found in this express catering service invoice example are the following: the name, logo, and contact information of the catering company; catering information, such as date of catering, number of attendees, setup time, and serving time; and contact person and his or her contact details. When creating an invoice, do not forget to ask the client about the following information: catering date, delivery time, collection time, fax, company, department, invoicing address, name of the function, number of people attending, expiration date, and special delivery instructions.